At the request of a good friend of mine, I did another reading looking at the world. This time, I am using one of my own recently-created spreads – my Conquering Fear spread – to examine what the world might be afraid of. 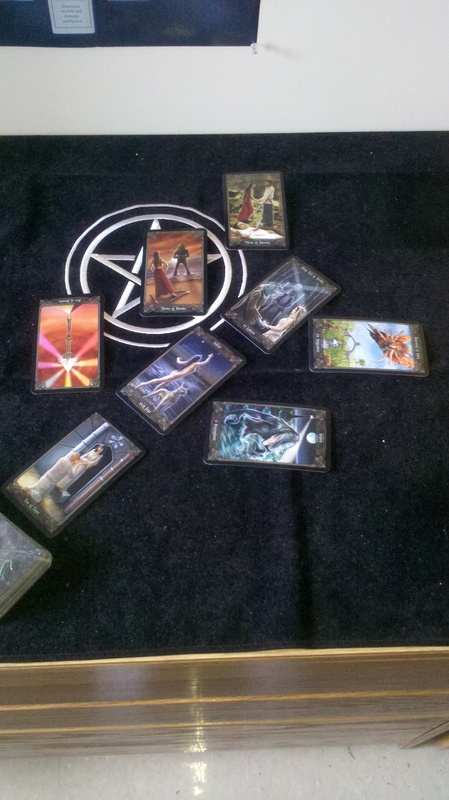 The question I asked was “What factors should I look at if I seek to understand what the social, environmental, physical, and metaphysical world fears and what it might hope can be done to assuage those fears?” I used the Necronomicon Deck. The underlying cause of the world’s fear is the Six of Cups, or the Satisfaction of Water. This indicates that the deepest root of the world’s fear is of increase, gain, happy expectation, and hope. This very interesting, as it seems to indicate that the cause of the world’s fear is optimism itself; it is afraid on its deepest level of hoping for the best. Why is this? It could possibly be because the world is afraid of hoping for better things, because it believes that its hopes and dreams will always be unrealized. I can understand this attitude; I feel this way quite a lot, and with the current situation of the world, these feelings are understandable; just look at how we’re handling climate change and all of our social issues. Despair and surrender are the cause of the world’s fear. Again very interesting; the form that the world’s fear takes is Ishtar, the Star. They key thing here, I think, is that the form the fear takes is that of a guiding light; the Earth feels as if it is being misguided by its caretakers: the human race. We have caused many of the problems that the world is facing, and we are either doing little to fix things or exacerbating the problems. Our failure to effectively regulate environmental pollution is one example of this. Society also might feel that it is being misguided by its rulers, and is actually afraid of its guiding lights. The Star is also associated with a renewal of energy, and perhaps, again, the Earth is afraid of the form that this renewal of energy will take. Humans are sapping the Earth of its energy, and maybe it fears that we will be unable to find a renewable source of energy (literally and figuratively) before it dies. This explanation would make more sense if the card was reversed, but holds this way, too. The Deep One and Bride represent the effects that the fear has on the Earth. In this case, I think it is safe to interpret the two Lovers as the Earth and the human race. The Fear, then, is directly affecting the loving and caring relationship we have with the world: natural disasters are striking more often, social unrest is occurring everywhere, and everyone is doubtful about the future. Looking at the situation from an outsider’s angle, the current world situation could be seen as a spat between two lovers, with the two needing to understand each other once again. Of course, the blame is not equally distributed, and humanity is more at fault here. The Fear, then, is creating a disconnect between the Earth/world and humanity, which just makes everything worse. The Guardian of Eden. Interesting; a reaction to the fear of hoping for too much is to bring about a final judgment and just end it all, righting all wrongs in one blow. Perhaps a good reaction of the world – materially and in the social sense – would be to punish those responsible for misguiding the human race (see Position 2), or just punish the entire human race. In the end, that is what will end up happening if we can’t stop our levels of pollution; climate change will punish us all, and the Earth will take this road to deliver herself from its fear, and wait for a new guiding light. Dagon. A harmful reaction to the fear of the guiding light is to stick with tradition. This, to me, seems like a blatant jab at conservatives; it will be harmful to do things just as we have always done, or to rely on the current authority (the current guiding lights) or religion to save us. To look at the past and make our responses based upon it will not help us in our moment of crisis, as we have never seen anything like this before. Tradition is not the answer; innovation is. Purpose. Motivation. Energy. The Matrix of Fire – reversed. The source of the Earth’s courage to do what must be done will come from hidden (hence the reverse) reserves of Fire and drive we never knew it possessed (if it’s going to bring the day of judgment to us all, then Fire will be necessary). The Fire it will draw its courage from is not a blazing bonfire, but rather a more subdued, steady flame; perhaps a reflection of the long path it will take, and its boundless reserves of inner Fire and spirit. The Earth thinks on a different timescale that people do, and so do society. The Fire that will give the collective consciousness and the physical Earth courage burns slowly but steadily and strongly, allowing for a stable source of courage. The Establishment of Fire. The form the world’s courage will take will, paradoxically, be optimism. The underlying root of the fear of the world is hope itself, and in order to conquer the despair of having given up, the world will need to learn how to take control of its optimism. It will face its fear head-on and meet it, and absorb and transform the optimism. Optimism can provide the fuel for the drive for change, and the world will learn to harness its optimism despite its strong misgivings, perhaps using this optimism and slowly-building fire to bring about the Judgment that may come to pass, cleansing the world of those who defile it. This card is also associated with discovery, which again hints that the to create change courage will come (as it tends to do with social change) from progressives, who innovate and expand upon the old, not content just to accept things as they were or return to the past. A new order will be established, one that restores the balance of the Loving relationship between humanity and the world. Not a positive ending note; the Regret of Air. After conquering the fear through the energies of Fire, the world will experience regret. This indicates that there will be much loss before the world’s fear can be overcome, and its guiding lights are once again people it can trust and people it can believe in. This card can represent kept promises, as well, and perhaps could indicate that people will realize that they have a promise they must keep with the Earth, and will respect that covenant once more and care for it. Sorrow and grief will accompany the loss of fear and the gaining of optimism, which will be caused by this to transform into realism, and hopefully the world will be a better place for it. This spread is not particularly useful for these abstract questions, I think, and is really meant to be more for practical readings. Still, it was a very interesting exercise! This entry was posted on April 8, 2012 by Z. M. Wilmot. It was filed under Tarot .